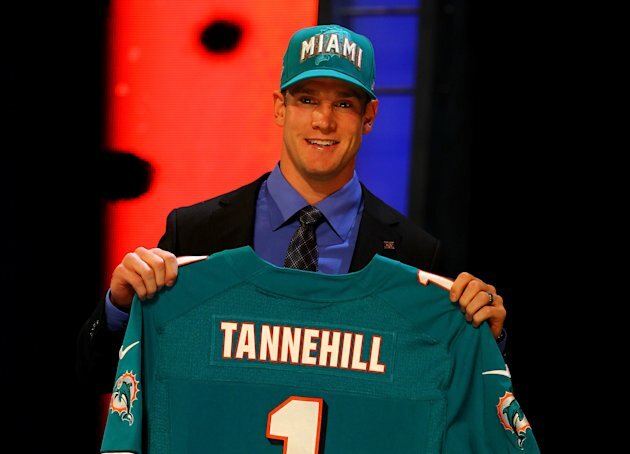 Well, the first day of the 2012 NFL Draft has finally come and gone for the Miami Dolphins. After months of studying, discussing, and predicting we officially know who the Dolphins have drafted eighth overall. While it may seem like an anticlimactic ending to the hours and hours that we have spent discussing prospects, I assure you that the discussion has only begun. The next few years are going to be very interesting to follow. We will spend next offseason (most likely) wondering whether Tannehill will be ready to start. Heck, maybe something miraculous will happen and he'll be ready to start this year. I highly doubt that, but you never know. He's a hard working kid, and you know he's going to do his best to win the starting spot. I know we have a lot of people who weren't very excited with the pick because we spent a very high draft choice on a player that probably won't start for another year or two, but I want you guys to hear me out on this one. Here are a few reasons why I am happy with us selecting Tannehill. Tannehill has the potential to be a franchise quarterback. That much we know. It might take him a few years to develop, but it's not like we had another option this year anyway. We have two good quarterbacks in Matt Moore and David Garrard. They will be able to hold down the fort for a year or two while Tannehill develops, and they will also be able to help him in the development process because of their experience. Miami has gone too long without a franchise quarterback, and I think there is a really good chance that Tannehill becomes that franchise quarterback we've been searching for. Tannehill makes more sense with the Miami Dolphins than any other team in the league, and that is the truth. We have his old head coach as our offensive coordinator, we have players that can fill in for however long we need them to until he is ready to start, and we run a west coast offense which suits his abilities very well. Mike Sherman, who is our offensive coordinator and was Texas A&M's head coach last year, has been with Tannehill for all four years. He knows him better than pretty much everyone else in the league. I read today that Sherman really wanted Tannehill, which can only be good news for the Dolphins. Tannehill just makes too much sense with the Dolphins. His situation fits perfectly with what Miami is able to do. Not only can we afford to wait (and yes we can actually afford to wait, despite what most Dolphins fans think), we also have the right group to help teach him whatever he needs to know. I'm not saying it isn't a reach, but it's not like they took someone who was going to be taken in the second or third round. If Miami didn't take Tannehill in the first round, then someone else would have. They were unable to find a trade partner so that they could trade down and take him later, so if they wanted him then they had to take him at eight. It isn't like they passed on some surefire guy who was guaranteed to be a starter for a long time. The next player to be picked that we thought they were considering was Quinton Coples at 16 to the Jets, and he had question marks of his own. After him was Melvin Ingram at 18 to the Chargers and Riley Reiff at 23 to the Lions. I'm not saying that I wouldn't have liked to have any of those three, because I would. What I am saying is that taking Tannehill wasn't exactly a crazy decision. Getting players like Coples, Ingram, and Reiff would have been nice, but we need to help the most important position in football more: quarterback. See guys? Things aren't that bad for us. I believe that we have finally found our answer at quarterback: Garrard or Moore for 1-2 years and then Tannehill for (hopefully) the next 15. Thanks for stopping by. As always leave your comments below.